First International Delegation Visits CCCI – NORAM Engineering and Constructors Ltd.
NORAM’s brand new BC Research Inc. facility was the venue for a ground-breaking meeting – hosted by the Carbon Capture and Conversion Institute (CCCI) – between a European delegation and representatives of the Government of Canada, academia and local industry. The thirty-strong Carbon Capture, Utilization & Storage Study Tour (CCUS) was led by Canadian Ambassador to Norway, Mr Artur Wilczynski. 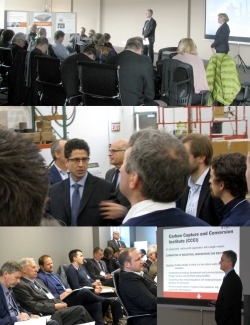 Delegates from Norway, Ireland and Germany toured the new BC Research facility, in which the CCCI is co-located, and received presentations from Gassnova, CCCI and local technology companies active in CO2 capture and product valorization. These included the University of BC, Inventys Inc., Carbon Engineering, Mantra Energy, CarbonCure Technologies and BC Research. The meeting, which included the Norwegian state enterprise for carbon capture & storage, Gassnova, and the Norwegian Ministry of Petroleum & Energy, set the stage for multi-lateral exchange and cooperation in the nascent, but fast-growing CO2-utilization economy. The CCCI innovation hub is a collaborative initiative between BC Research, CMC Research Institutes and UBC, aimed at solving the complex challenges of reducing industry’s carbon footprint.